We often see Latin in our churches - especially older ones. Saint Joseph’s is no exception. So why do we have them if most Catholics don’t understand Latin? Liturgies celebrated in Hebrew by the Apostles and then also in Greek and Latin by Christians of the early Church. Essentially these were languages that people spoke and understood. Liturgies were translated and written down in other languages spoken in the first millenium such as Coptic, Ethiopic, Syriac, Armenian and Slavonic. These languages continued to develop as normal, but the written liturgies were not changed to reflect this. 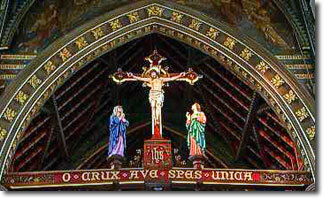 By the 15th century the languages used in the liturgy were generally not understood by the faithful. The texts used were essentially those of the first millenium and it was a hot issue in the Church as to whether they should be translated into the vernacular (the languages spoken by the people). The Council of Trent said No, the Protestants said Yes and translated not only the liturgy, but the Bible as well. At the Second Vatican Council in the late 1960’s the Church decided that the Mass could be celebrated in the languages that people spoke. These inscriptions then, are little connections with the countless Christians who have gone before us, some of whom would have understood the words even though they couldn’t read or write. These connections are important.